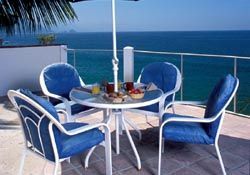 Casa Las Palapas is a wonderful 5 bedroom, 7 1/2 bath villa located right on the ocean, just five minutes south of Puerto Vallarta. 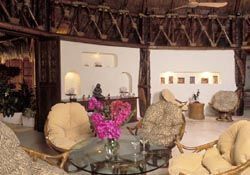 Escape the fast paced world through ornate, hand-carved wooden doors into a sunlit courtyard, which includes a furnished palapa-covered exercise/sitting area with an electric treadmill, stationary bike and comfortable chairs in a relaxed garden setting. Stroll into this spacious, marble tiled, fully furnished living room consisting of two levels under a huge, varnished palapa. 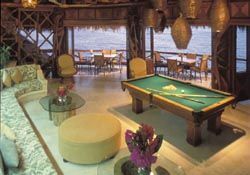 The living room also features a multi-speaker stereo system, TV/DVD, full sized pool table and a spectacular 180-degree view of the ocean, pool, rocks, and swaying palms. Just off the upper level is the Chef's Kitchen, complete with commercial range, side-by-side refrigerator, huge center island work area and endless cabinets brimming with every cooking need. 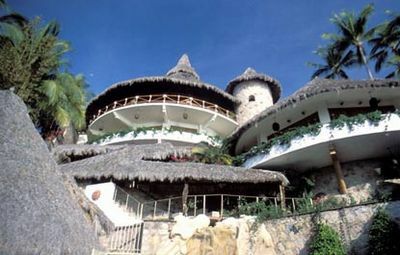 The villa also features a grand spiral staircase and a cable car, both provide access to this sprawling estate. Covered walkways marked with dozens of flowering tropical plants enable guests to meander from room to room and level to level. The master suite features a king size pedestal bed along with two sitting areas, adjoining his and hers bathrooms, a small fridge, TV/DVD, phone and air-conditioning. 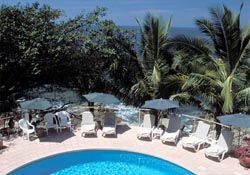 There are also two charming ocean view rooms, one with a king size bed, the other with two single beds (convertible to a king) Both rooms are furnished with private in-suite showers; phone, large closets and quiet, remote controlled, air-conditioning. A refrigerator, discreetly placed in a corner of the long, ocean view terrace, holds snacks and refreshments for in-between meal consumption or midnight raids. The fourth bedrooms come complete with a Spinet piano and air-conditioning, queen size bed, private en-suite. The fifth bedroom is located directly across the roomy patio from guestroom #4. 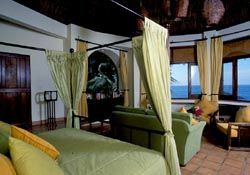 This spacious room offers a glorious view of the nearby Bay of Banderas through its large picture frame windows. Relax on the king size canopy bed while the ocean breeze laps over you or cool down even more with the help of the dual air-conditioning units. 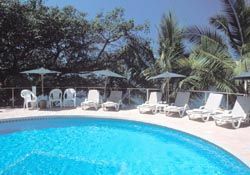 There is a wonderful circular, heated, fully tiled pool with an adjoining palapa covered Wet Bar and Ample pool deck space set amidst the surrounding rocks. 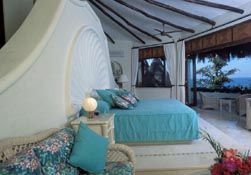 Down a few steps from the Ocean Terrace, is a charming, palapa-roofed cabana/office which opens directly to the pool. The office has a granite desk with an ocean view along with a bathroom with shower.